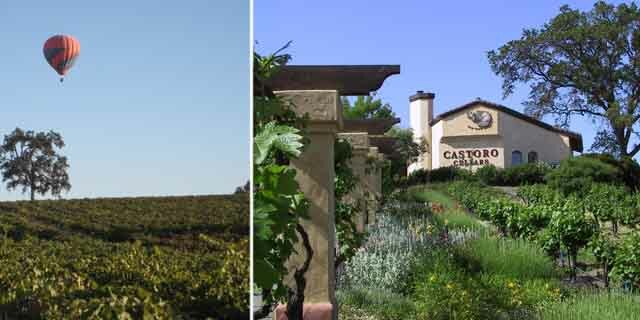 Castoro Cellars’ Mediterranean-style tasting room is located in the heart of Paso Robles with easy access from scenic Highway 46 West. The picturesque setting is t­­­he perfect place to enjoy wine tasting. The courteous, knowledgeable staff is eager to assist in making the experience memorable. Guests are encouraged to bring a picnic to relax while taking in the spectacular views. The Castoro Cellars event gallery and gardens provide a beautiful location for special events such as weddings, receptions, parties and meetings. The facilities offer an elegant site for any occasion, from casual to formal, and are competitively priced. The courteous and helpful Castoro Cellars event staff provides excellent service and attention to detail in order to make every special event unforgettable. is beaver in Italian. The name and the motto stuck. Castoro Cellars’ “Dam Fine Wines” sport a picture of a beaver on each label. The 150-foot grape arbor at the tasting room entrance leads to gardens featuring lush native plants and specimen cork oaks. The beautifully landscaped grounds with grand views are the perfect place for a picnic. Throughout the year, Castoro Cellars hosts concerts for musicians from around the world. During the summer the shows are held outside with the vineyard and sunset as the backdrop. Winter concerts are held in the cozy bistro atmosphere of the event gallery. Beaverstock: September 17, 18. Tickets on sale. offers an alcohol-free grape juice.